Coming of age in the '60s meant a lot of disillusionment. Cigarettes, it turned out, weren't good for you. Leaders weren't murdered by lone gunmen. Nobody attacked our ship in the Gulf of Tonkin. A president, despite his denials, was a crook. And, your favorite bands did not play on their own records. Anyone over the age of nine knew that the Monkees, the made-for-television group, didn't play the instruments they mimed on TV, but what about the Byrds, a group revered for its musicianship? Wasn't Dennis Wilson banging the drums on the Beach Boys' “Good Vibrations”? What about the Association, Jan and Dean, the Mamas and Papas, Simon and Garfunkel and Herb Alpert's Tijuana Brass? The truth is complicated, and has more to do with the record business in the '60s than with the bands. Time is money, and producers, rather than herding the squabbling, less experienced band members, would hire the top studio session players, who not only could play the music brilliantly, but could also improvise and arrange, adding that catchy bass line, for instance, that would ensure a hit song. (Think of “Windy” and “The Beat Goes On.”) The practice harmonized with the music business' migration from New York to L.A., the land of swaying palm trees and illusion. 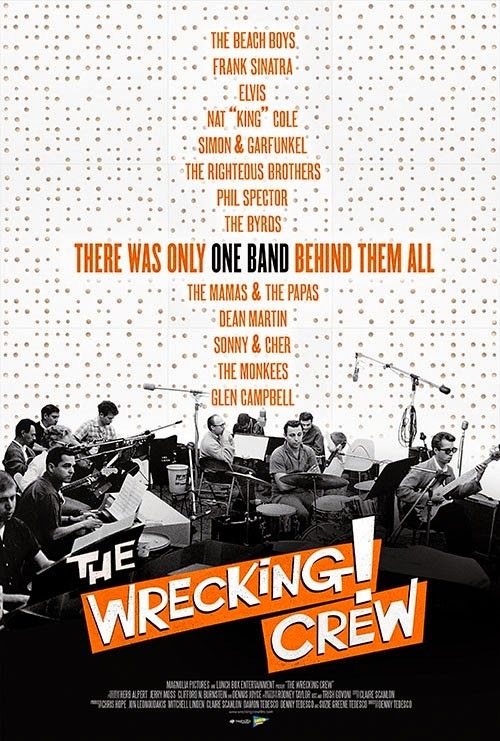 The top players, an anonymous crew of about 20 versatile virtuosos, became known latterly as the Wrecking Crew, supposedly because it was said their rock-and-roll playing would “wreck” the music industry. The group included some future solo stars: guitarist Glen Campbell, who played on “everything,” and keyboardist Leon Russell, who says playing on demos earned him $10 a song, which meant “I got to eat that day.” The talented session players are the focus of THE WRECKING CREW a marvelously entertaining documentary by Denny Tedesco. The film was completed in 2008 but delayed from general release because of record companies' exorbitant fee demands for the song excerpts. Tedesco is the son of the late guitarist Tommy Tedesco, and the film is in part a tribute to his father, a humble, affable fellow shown in home movies giving funny musical talks about his session-playing days. Tedesco, known as the “King of L.A. guitar soloists,” had a long career even after the Wrecking Crew days, playing music for innumerable TV shows and films. His son's film features illuminating interviews with the musicians (many who have since died), producers and recording artists. Like Dorothy's Toto, it pulls back the curtain on the cynical machinery behind popular music. It is a companion piece to the documentaries STANDING IN THE SHADOWS OF MOTOWN, about the Motown house band the Funk Brothers, and 20 FEET FROM STARDOM, about backup singers. Saxophonist Plas Johnson, a New Orleans-based jazz player, was recruited by Capitol Records in the mid-'50s after backing B.B. King and Johnny Otis, and played on countless records and movie soundtracks (that's him on the “Pink Panther Theme” and “The Odd Couple”). Guitarist Bill Pitman, now 95, a session man discovered and brought into rock and roll by Phil Spector. Pitman is known for the distinctive ukulele on “Raindrops Keep Fallin' on My Head” as well as his work on numerous rock albums, TV shows and movies. Drummer Earl Palmer, an influential New Orleans jazz musician with a low regard for rock and roll, backed Fats Domino, Little Richard and other NOLA artists before joining the Wrecking Crew, playing and recording nonstop during the ensemble's heyday and going on to work continuously in film and TV. (Palmer died in 2008.). Life on the Wrecking Crew had its benefits, including steady work and high pay; Carole Kaye recalls that at one time, “I was making more money than the president of the United States.” But the nonstop session work also wreaked havoc on family life, leading to divorces and children rarely seen. Then there was the record companies' cupidity. A great many instrumental albums of the Wrecking Crews' music were released, bearing the names of fictional groups like The Marketts. The session musicians received no liner credit, and the album jackets featured photos of clean-cut young men purported to be the artists. The revelations of studio legerdemain might be surprising, but the essence of the hit song is the song -- the gorgeous lyrics of the Byrds' Gene Clark, Jimmy Webb's transcendental poetry, Brian Wilson's aching yearnings for eternal summer. The studio polish just enhanced their expression. Many of the bands of the era were accomplished players -- just not up to the one-take perfection producers demanded. The early '70s were more artist-driven, and such fakery was no longer acceptable. Musicians began bringing their own sidemen to recording sessions. Carole King, for example, hired James Taylor to play guitar. The golden decade of the Wrecking Crew came to a close. “It was never meant to last, this magical bubble,” songwriter Jimmy Webb says wistfully. 4 out of 4 stars.